Fomalhaut A -- Evidence for a planet. Update: Planet confirmed. Beta Pictoris -- Evidence for 3 planets. Update: Planet confirmed. HD 81040 -- Planet detected. TW Hydrae -- Evidence of one or two planets in formation. AB Aur -- Possible superjovian/brown dwarf imaged in formation in the disk. Cha J110913-773444 -- Planemo forming planets? V866 Sco -- Water vapour detected. DR Tau -- Water vapour detected. OTS 44 -- Brown dwarf with disk. HD 135344 B -- Evidence for planet formation. AA Tau -- Hydrogen cyanide, acetylene, carbon dioxide, water vapour detected. SR 21 -- Evidence for planet formation. Epsilon Eridani -- One planet, and an unconfirmed planet. I realise that there are probably hundreds or thousands of known stars with protoplanetary disks, but any that anyone here knows of, if you would list them I would be grateful. I suppose debris disks, too. Any would be helpful. If anybody can point me toward more systems with disks, both protoplanetary or debris, it would be very helpful. Also, here's all the systems I've been able to find that exhibit the "Vega phenomenon" (structure in disk pointing to a planet). Thought I give you some off-the-wall ones. Regarding the suspected protoplanet at CoKu Tau/4, it turns out that the system is binary, so it turns out a planetary system is not the explanation for the disc being cleared out. Lazarus wrote: Regarding the suspected protoplanet at CoKu Tau/4, it turns out that the system is binary, so it turns out a planetary system is not the explanation for the disc being cleared out. Back in 2004, now, 4 years later. A bust. This is a very interesting topic. It should become sticky, because the number of proplyd-hosting stars is going to increase very quickly (as well as that of protoplanet-hosting ones according to recent detections). I will give my contribution to enrich this thread. An interesting idea. Protoplanetary disks are quite important for planet formation, and you're right, more such systems are being found. And with the detection of planets at Fomalhaut, Beta Pictoris, and HR 8799, planet-forming disks perhaps deserve to have more attention. Edasich wrote: I will give my contribution to enrich this thread. Once I found this article discussing about possible existence of substellar companions around these two stars. Having analyzed long-term series of photometric observations for UX Ori stars (UX Ori, SV Cep, and RZ Psc), we found evidence of possible periodicities in their variability. Multiperiod variability with a nonlinear interaction of periods (modulation) was suspected in SV Cep. The cyclic variability is probably caused by large-scale nonuniformities in the circumstellar dust disks. 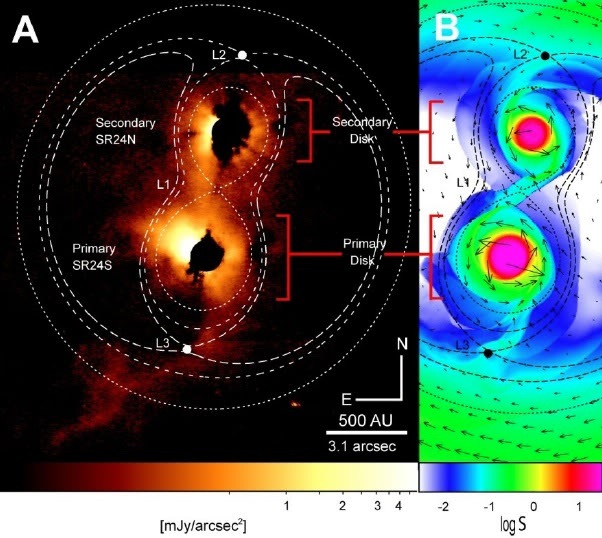 The mechanism for the generation of such nonuniformities is assumed to be the interaction of the circumstellar disk with the binary star or a planetary system*. CQ Tau : P= 30 years? The direct PDF link can move. To search, just type the key, "harvard" and the title of the paper, 90% guaranteed to find it on Google. I'm sure you can get catalogues of debris disk stars, T Tauri stars, etc. from VizieR. You can also "right-click-and-save" the link. 2MASS J12373919+6526148 (T6.5 BD) + companion? Lazarus wrote: I'm sure you can get catalogues of debris disk stars, T Tauri stars, etc. from VizieR. I've never toyed with VizieR before. What is it? Actually, the chart was made up based on information from a paper I don't remember from. Marasama, you're wonderful ^_^ I'm just eating this up. It's great stuff!! Edasich wrote: This is a very interesting topic. It should become sticky, because the number of proplyd-hosting stars is going to increase very quickly (as well as that of protoplanet-hosting ones according to recent detections). Alright, I've set it as a sticky post. If anyone here doesn't like the idea, yell at me and I can change it, lol. Furthermore, I've re-named it from "protoplanetary disks" to "circumstellar disks". I was using that to find binaries and stellar radii. Anyway not always you get what you're looking for. In this case you do. The star should be also binary, I remember. Worth noting in that example that the northern source is a binary star composed of SR24Nb and SR24Nc. And since the spiral arm is implied to be a density wave in the outer disc, it means the image contains a circumstellar disc (around SR24S), a circumbinary disc (around SR24N) and a circumtriple disc... pretty neat.